Editors note---We have added a new writer to the staff. He has been vetted at least as well as Van Jones, and we all heartily approve of his review spewing talent. I spent the better half of the past 4 years screaming at the top of my lungs like a lunatic at "those darn kids with their cell phones and their texting." It was just a phenomenon I couldn't wrap my mind around. To my way of thinking, if you wanted to communicate with someone and you have a perfectly good phone in your hand, then just call them. How hard can that be? Recently the opportunity for me to get a cell phone arrived and I decided that I might as well see what all the hub-bub was all about with texting. 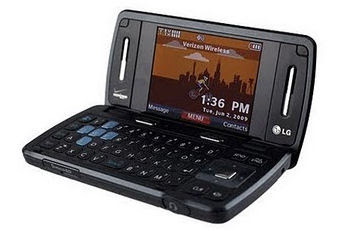 With that in mind I went ahead and got what I would consider the ultimate texting device; the enV3 by LG. My wife has had the enV2 for almost 2 years now and her and the teenagers love it. The enV3 is everything good about the enV2 just better. The buttons are big enough and spaced just right for anyone, including a sausage-fingered fat guy like myself, to text with the greatest of ease. It has an improved screen inside and outside, a vastly improved camera (now 3 Megapixal instead of 2 Megapixal), and the addition of a flash. There is increased battery life, but if you're using that flash to take pictures of your junk all day long, you better just leave it plugged in. Not that I do that with my enV3, I mean, that's gross. Yuck. The best improvement unfortunately leads to the one downside to this phone. With the enV2 the SPACE bar was way over on the bottom-right of the phone. With the enV3 they moved it to the bottom-center. Absolutely inspired, but they put the "B" button on the right of the SPACE bar. 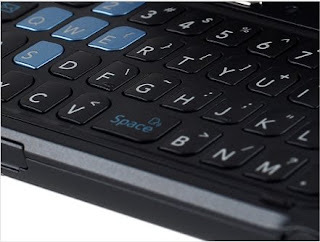 What is the point of having a QWERTY keyboard on a phone when you force people to type the letter "B" with their right hand instead of their left? Sorry LG, this case of utter stupidity on your part cost you a perfect 5-star rating. Bottom line, if you liked the enV1 or the enV2 and want to upgrade, the enV3 is a complete no-brainer, just go for it. If you're considering switching from a different type of phone, this is a great phone with good sound quality, it weighs enough so you know you're handling a thing of quality, but light enough to talk on all day long, and the easiest keyboard to text with (except for that mocking "B" button - it just has it in for me). One other thing. When I got this phone I was warned by both Matt and Meatwad that I should be prepared for the onslaught of texts coming from both of them. I have been neither shocked nor awed. There has been no onslaught. I have found that Meatwad is a complete texting slacker; only responding once to ever 10 or 12 of my texts, but at the same time he gets all ticked that Matt doesn't seem to text him anymore now that I have a phone. Strange. Matt texts me several times a day. Something must be wrong with Meatwads phone. Maybe he should finally upgrade to the enV3. I give the enV3 4 stars, and if they will just move the "B" button over to the left on the enV4 it will get a perfect 5 stars.